For many of us, we consider our pets’ part of our family. So it is no surprise that when we plan a weekend away, we like to include our dogs (and sometimes cats), too! 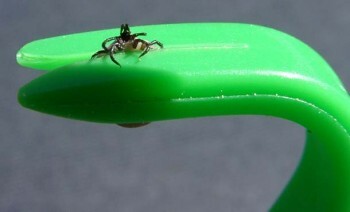 However, traveling can be highly stressful for you and your animal companions if not done safely and properly. With thoughtful preparation, you can ensure a safe and comfortable trip for everyone. Start preparing for your road trip with your pet by making a copy of all your pet’s medical records and ensure that they are up to date on vaccinations, as well as flea prevention and for your dog, tick and heartworm prevention. If your pet gets sick on the road, this will make it easier for another veterinarian to treat your pet. Make sure you are familiar with the locations and hours of some of the veterinary clinics on the way to your destination. If an emergency were to arise while you are on the road, knowing where the closest veterinary clinic is can save you precious time and help your pet receive medical attention faster. 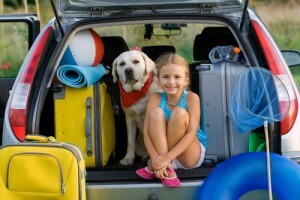 Will this be your pets first time travelling in the car? If so, make sure you take your pet on “practice-runs” to ensure they are comfortable in the car, and are not nauseous or uncomfortable. Start by taking them on short 5-10 minute drives, and slowly increase the time in the car and monitor how your pet adjusts. Keep smaller pets (small dogs, cats) safe and secure in a well-ventilated crate or carrier. If you have the space in your car even larger dogs can travel comfortably in a crate. There are a variety of wire-mesh, hard plastic, and soft-sided carriers available. Make sure the crate or carrier is large enough for your pet to stand, lie down and turn around in. Larger dogs that are not in a crate still need to be restrained to keep them safe. A pet seatbelt, or a harness and leash attached to the seat belt can ensure your large dog is safe in the car. Feed your pet a light meal 2-3 hours prior to travel. A full stomach can lead to car sickness. Plan where on your route you will be able to stop so your pets can relief themselves, and are able to walk about, and take a small drink before continuing in the car. Bring your own water for your pet, or purchase bottled water while on the road. Not all tap water is filtered, and tap water from an area your pet is not accustomed to can upset their stomach. Keep your pet’s head inside the vehicle. Although it may seem like fun, flying debris could cause injury to your pet’s head, eyes or ears, and your pet could also pose as a distraction to you and other drivers. Also, abrupt stops and tight turns could lead to injuries for your dog. If you know that you will be making stops and overnight accommodations, make sure you plan and book them ahead of time. Not all hotels are pet friendly, so it is important to find pet-friendly accommodations and to let the hotel know exactly what type of pet you are bringing. Some are strict on what pets they allow and may only accommodate small dogs and cats. Make sure you tell them the breed of your dog to ensure there are no surprises when you arrive. Make sure your pet has some sort of identification on them. If your pet does not typically wear a collar with a tag, it would be a good idea to have them wear one while you are away from home. If your pet is microchipped, make sure all the information is correct and you know the microchip number, so if your pet does go missing and his/her microchip is read, the microchip company will be able to contact you. Let your veterinarian know that you are travelling with your pet and where your destination is. If something was to happen and your pet needed to see another veterinarian, your current veterinarian will not be taken by surprise if they call to request history or information about your pet. Sometimes it is not always possible to bring our pets with us when we travel. In that case, make sure you have a responsible boarding kennel or family friend to care for your animals when you are away. It is NOT recommended to leave your pets unsupervised for an extended period of time, even if food and water are left out. If you do travel without your pet, make sure you notify your veterinarian and provide them with the contact name and number of who is caring for them. Leave all the medical records for your pet accessible for the caregiver, and ensure they know who you pet’s veterinarian is and their location, as well as directions stating what you would like to do regarding treatment until you are able to be reached in case an emergency should arise. Always provide them with your best means of contact, and an emergency contact in case you are unable to be reached. The Animal Clinic of Brooklin wishes you and your pets safe and happy travels!